Ariani was graduated from Sutherland-Chan School of Massage Therapy in 2017. 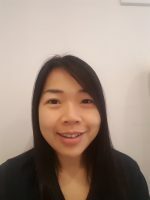 She pursued her certification of Medical Acupuncture at McMaster Univeristy in 2018. She also provides cupping to reduce muscle tension and myofascial restriction. She shares knowledge to her clients of postural awareness and exercises to help them improve their mobility. Swedish/deep tissue massage, myofascial therapy, aromatherapy, and prenatal massage.